Somewhere at the intersection of being a photographer, and a family historian, is the dangerous "hobby" of rescuing other people's discarded photos. You'll find them on eBay, in albums and alone; in antique shops, junk stores, postcard dealers' collections, second-hand bookstores... all over the place. They are mostly nameless people; at best, there's a scribbled first name on the back, or a date, of the photographer's mark. You have to realise that you'll go bankrupt before you reunite any of these photos with any long-lost great-grandchildren. They might have been the ones to let the photos go in the first place. I eventually sold my collection, for less than I'd paid for it, to an antique dealer. But I kept one album. And I still have to be very careful about what I look for on eBay! The gentleman above is why I kept that one album. Dressed in his Sunday best: polished, laced-up boots, woollen trousers, a beautifully-white shirt, a jacket and matching waistcoat, a bow tie and a brushed felt cap. 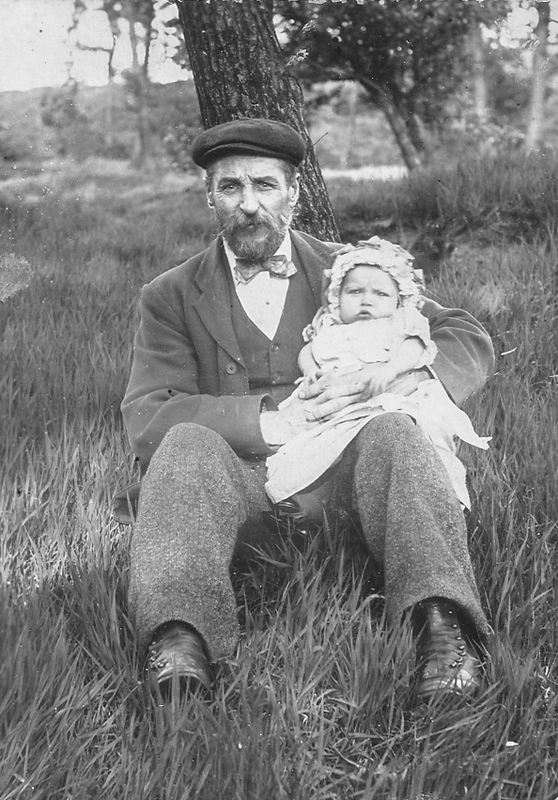 His beard is groomed, and he proudly holds a baby who wears a bonnet and pressed, clean and bright layers of cotton. They are sitting in the grass, the man staring intently at the lens. I think his eyes are blue. But who is he? I haven't a clue! There's no name on the photo, not even the stamp of a photographer's studio. I can't say who is the copyright holder... though it's over one hundred years old. I'd love to know who the photographer was. He or she captured this man's expression so beautifully. The other photos in the album come from photographers studios in Nottingham, England, with at least one being taken in Sheffield. One photographer was E. P. Short; another, G. Caldwell. I don't know if they took the photo of this gentleman. If you know who he is, please let me know. Because I have a whole family photo album to go with this; the men, women and children in this lovely man's life.